CONFESSIONS OF A PLATE ADDICT: Merci Beaucoup for the Awards! Merci Beaucoup for the Awards! I am so honored that several of my dear friends in Blogland have been so kind as to think of me in the form of some very special awards! I ask their forgiveness for taking so long to post them! The first is this wonderful Love Blog's "The Spreader of Love" award from Riet at Quiltin' n Stitching lady. If you have not been to Riet's blog, you have missed a real treat! She is a very talented lady with a heart of gold! You will be amazed by her creativity. I must say that I am in reality the recipient of love, because I have never met a more wonderful group of ladies than we have here in Blogland! The only rule for this award is to pass it along to five people and spread the love! The next award is from Christine at Christine's Home and Travel Adventures. Christine is a friend from Rate My Space and from MicasaStyle whose blog you will not want to miss! She has a gorgeous home and has a special post every Saturday with fabulous photos of her world travels! 1) Accept the award and post it on your blog along with the name of the person who gave it to you as well as a link back to their blog. 2) Pass the award on to 5 blogs worthy of the award. 3) Be sure to notify the recipient that you have left them an award! 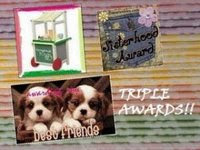 This next award is a Sisterhood Award from Ann at Life at Ann's Place. If you have not visited Ann's blog, you need to rush right over there right now! You will be met by the kindest, sweetest and most selfless lady in Blogland. She is always thinking of others! She'll take you in and treat you like she's known you all her life! Here are the rules for the Sisterhood Award recipients: Put the logo on your blog or post. Nominate at least 10 blogs which show great Attitude and/or Gratitude! Be sure to link to your nominees within your post. 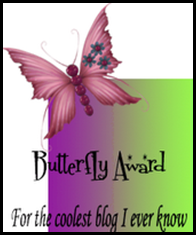 Let them know that they have received this award by commenting on their blog. Share the love and link to this post and to the person from whom you received your award. Michelle is lovingly renovating her home and we have the pleasure of following her through the process step by step. You will be amazed at what she has accomplished thus far in her lovely home! She is a bundle of energy! Kristen is another friend from Rate My Space who is without doubt one of the most creative people I have ever had the pleasure to know! You will enjoy visiting her lovely home and also getting a peek at what she has in store for you at her online shop! What this award is about...Bloggers who show great attitude and gratitude. Wow, so many great awards! Your deserve them all and then some! Congratulations to you! I don't know a more deserving person. I am a bit overwhelmed at how people keep up with this. You are right about the fantastic people you meet on here..you being one of the most fantastic. :)You have been so very sweet to me. You are fantastic not just because of your kindness to me..but.. :) YOU LOVE PLATES!! I can't have enough of them. They are actually stacked....well..never mind. Anyway..the women who chose you, chose wisely. Hi Debbie...You certainly deserve every one of these awards & more...I do agree with you that it's impossible to pass them on to only a few. Congrats Debbie on receiving so many great awards! You are very deserving! Have a wonderful Sunday girl! Congrats on all your awards! It is hard to pick who to pass them on to! Hi Debbie! Congratulations on all of your blog love! You really are the sweetest one! Be a sweetie and thank you for your visit. You certainly are worthy of these awards and more. I can tell through your writing and musings that you are a creative, inspiring and caring soul. 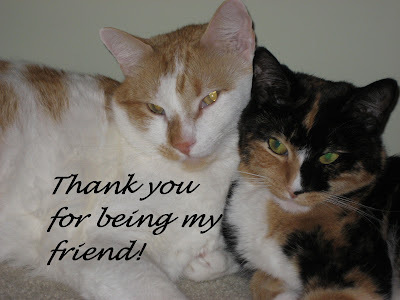 I'm glad to have you as one of my first blog friends. I bet you were a fabulous teacher! Did you see my next post. One bird is back. Debbie, I agree with these ladies you are very deserving of these awards. I actually just left you one on my blog. I just wanted to let you know how sweet you are, and how much I appreciate you. Thanks for letting me share my blog with you. I am so happy you are my friend. You are a dear sweet person. Hi Debbie...you said it so perfectly, this blog thing is just amazing meeting so many wonderful women of all ages all over the world...It's the best thing I have done in a very long time....I asked Manuela and the other Deb at Driven55 about meeting one day for lunch, how about joining us...Your in Atlanta too aren't you?? How wonderful it is to be recognized by three fellow astute bloggers. Two I'm familiar with and the third will be checked out forthwith. Congrats to a delightful and oh so smart cyber friend.